The diameter of the barometer scale. The larger the barometer and it's scale, the easier it is to discern small changes in pressure. The range of pressure values that the barometer covers in one traversal of the scale. 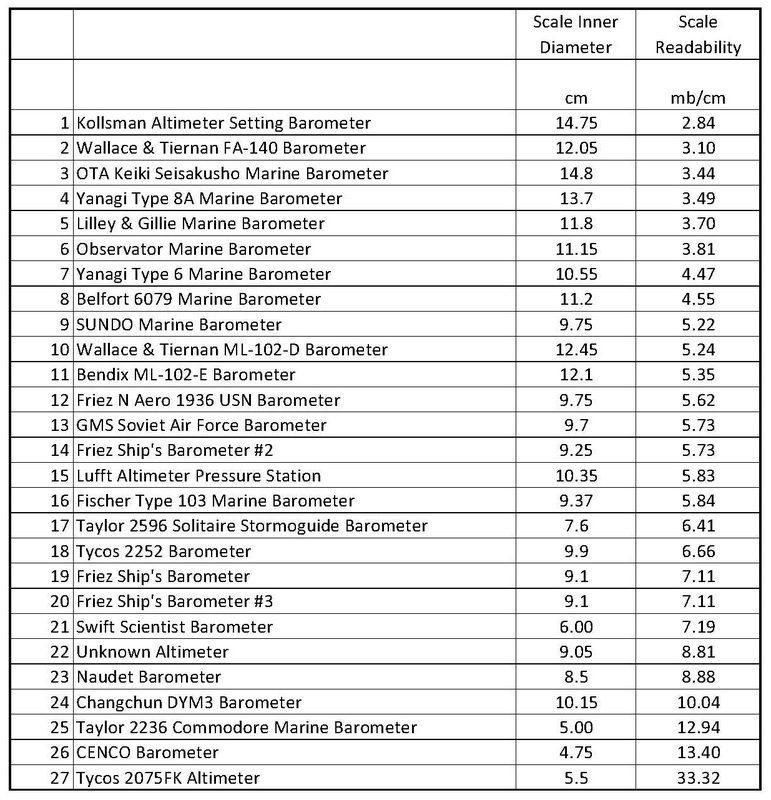 For the aneroid barometers in my collection, I measured the readability of each instrument by using a ruler to measure the inner diameter of the outermost pressure scale and the pressure range over a 180 degree slice of the pressure scale. From these values I calculated the readability in millibars per cm of pressure scale. The lower the readability in mb/cm, the more readable the barometer scale. Descriptions and photos of the barometers may be found in the 'Weather Instrument Collection' page on the home page of the website, under 'Aneroid Barometers'. The barometers at the top of the table are either very large or have a limited range of pressure values, such ar the Wallace & Tiernan FA-140. Altimeters tend to have reduced readability due to the desire to cover a large range of altitudes and, correspondingly, pressures. Pocket barometers have the lowest readability due to their small size. The only pocket barometer on the table is the Tycos 2075FK Altimeter at the very bottom of the table. It's a rather large pocket instrument at that. Although interesting as antiques, I generally don't collect pocket barometers.